The pharmaceutical sector in the United States is undergoing a seismic shift. In recent years, generic pharmaceuticals, which are equivalent to branded drugs in everything apart from their price and name, have been expanding their share of the market at a rapid pace. At around 50 to 70 percent cheaper than their branded equivalents, more and more governments around the world are opting for generic drugs in a bid to counter escalating costs in the medical sector (see Fig 1). According to a report by IMS Health entitled Medicines Use and Spending in the US: A Review of 2015 and Outlook to 2020, generic pharmaceuticals account for around 88 percent of medicines prescribed in the US, saving the healthcare sector a whopping $1.88trn between 2005 and 2015. By 2020, savings are expected to climb to more than 91 percent. While a handful of big-name organisations make up a large portion of the market, they are no longer the invincible forces they once were, leaving the door open for new and innovative players to make waves in the market. Among the new cohort of next generation pharmaceuticals companies is Alvogen. Founded in 2009, the company now has an annual turnover that exceeds $1.1bn, producing 350 pharmaceutical products for various markets across the globe. Robert Wessman, the CEO and Executive Chairman of Alvogen, is well placed to judge the current state of the generic pharmaceutical sector and predict where it might end up. 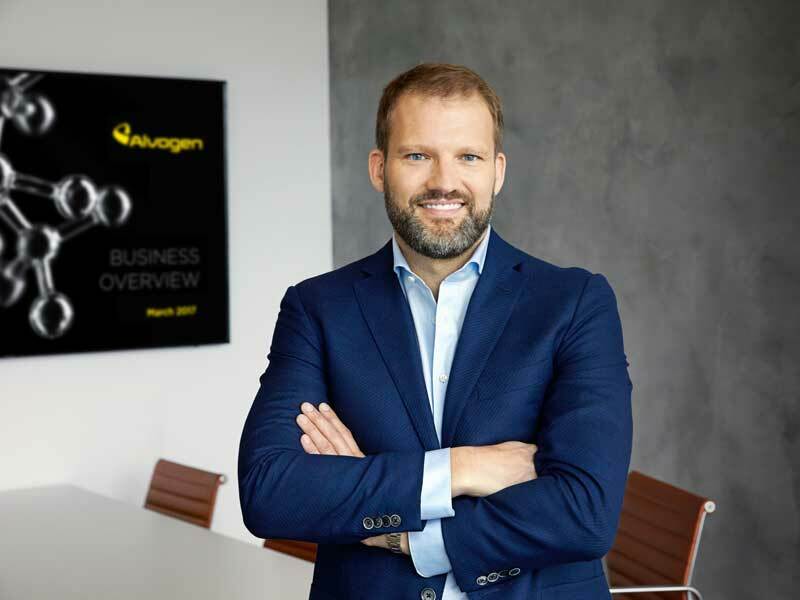 Speaking from the comfort of Alvogen’s European offices, which are situated in a new university science park in Reykjavik, Iceland, Wessman is surprisingly collected and focused given the uncertain outlook of the market his company operates in. The swift adoption of generic drugs can largely be attributed to the loss of patent protection by popular brands. The phenomenon, commonly referred to as the ‘patent cliff’, began in 1984 with the Drug Price Competition and Patent Term Restoration Act, and has since seen once-protected data being released all the time. The sophistication of generic pharmaceuticals thus continues to enhance, adding further to the industry’s consolidation and the growing support from governmental entities. The research and development needed to create new drugs can take well over a decade, and the process can cost hundreds of millions. The lengthy process and mammoth cost also involves overcoming numerous obstacles, with regulatory bodies, such as the US Food and Drug Administration (FDA) and the European Medicines Agency, requiring proof that the drugs are both effective and safe. In light of the time and money involved, the FDA, for instance, typically grants the manufacturer 12 years of a total monopoly via patent protection. Sales revenue accrued during this period enables companies to recoup the losses they incurred during development and encourages them to start the process again with new products. Generic drug manufacturers, on the other hand, operate quite differently. Given that the drugs they produce have already been formulated, developed and approved, the initial investment required is considerably less – a cost saving that is then passed on to the buyer. Despite this, entering the market has always been quite challenging for new players, but a change is now happening. Since January 2016, the index for listed generic companies dropped by 57 percent, while the broader index by Standard & Poor’s grew by well over 20 percent in the same period. Wessman says this is not just a passing storm hitting the industry, but the dawn of a “new climate”. Wessman explained: “Living in Iceland, I know how quickly the weather can change over the course of a day, so preparing for a sudden shift in market dynamics was something that came naturally to Alvogen. Wessman has the best part of 20 years’ experience in the pharmaceutical industry, having taken over the management of a small, near-illiquid generic drug maker, Delta, which would later become multibillion-dollar pharmaceutical business Actavis, in 1999. During this time, he says he learned “a thing or two” about how the industry works. This latest cycle in the global pharmaceuticals industry has been sparked by the consolidation of the US customer base for generic pharmaceuticals, in a trend that has been occurring since the formation of a true substitutable market, Wessman believes. “This consolidation was somewhat mirrored by the same phenomenon on the manufacturing side, as both attempted to take advantage of economies of scale. However, during the last couple of years, customer consolidation has greatly outpaced manufacturing consolidation. Instead, wholesalers have started teaming up with retailers in joint ventures that allow the combined partnership to act as one unit,” he explained. Currently, there are three material customers in generic pharma: WBAD, ClarusOne and Red Oak. Together, they control around 90 percent of the entire US generics market. There are also three main players in the overall US market – Express Scripts, Caremark and OptumRx – which together process more than 75 percent of store-based retail prescription claims. This has put more pressure upstream and forced the three large wholesaler groups (WBAD, Clarus One and Red Oak) to pass price savings onto them. “The result has been a similar loss in profitability for WBAD, Clarus One and Red Oak, which in turn has created more pricing pressure on manufacturers. However, it is not clear who seeks to benefit from the drastic price erosion in the US market due to the complexity of the US healthcare system,” Wessman said. While consolidation has created “giant” generics companies, Wessman said there are still more than 100 generic labels available in the US market today. This diversity is a function of a couple of factors. “First, there has been a massive investment made into generic pharma on both the private and public side. Second, the barriers to entry in starting a generic pharma company are lower than starting a new retail chain. It’s hard to imagine anyone creating a pharmacy or wholesale distribution company in the US that could compete with today’s big three. And with so many sources of products fighting for placement in the market, it is easy to see why generic price erosion is at a level never seen before,” Wessman told World Finance. During 2015, the industry was at its peak, with many generic companies acquiring assets at top prices. Valuations of listed companies were also high and, to maintain their valuation, assets were acquired at “any cost”, Wessman explained. Despite such activities, a considerable shift in the industry was afoot. “The signs of change were already there,” said Wessman. “An overheated market, rapid consolidation within the industry and a diminishing tolerance for unprecedented price increases of generic drugs were strong indicators that the market was ready for a shake-up. Looking ahead, Wessman foresees a period of “massive consolidation”, predicting that some companies will struggle with debt, while others may be forced out of business entirely – something that is “unheard of” in the industry, he says. Alvogen has also ventured into the biosimilars space via its sister company Alvotech, which was founded by Wessman in 2013. This subsidiary, he believes, will be crucial to achieving the group’s lofty objectives. Born and raised in Iceland, Robert Wessman had a fairly ordinary upbringing. The middle child of three, his father was the general manager of a hotel and his mother was a beautician. Although his parents afforded him plenty of freedom, Wessman developed a healthy work ethic at an early age, taking his first job in newspaper sales at the age of 10. “I wasn’t a natural learner,” Wessman revealed. “Like many entrepreneurs, I grappled with dyslexia.” It was only through his competitive and determined nature that Wessman achieved the grades necessary to study at the University of Iceland, where he enrolled in both medicine and business management. Unsure of which career path to take, Wessman left the final decision to the toss of a coin – business administration was the way forward, it decided. During his time at university, Wessman dreamed of starting his own company, but he knew he must first get the necessary experience. After graduating, Wessman worked in an Icelandic bank before helping a struggling shipping company turn its fortunes around. His success in this feat saw him eventually become the CEO of the firm’s operations in Germany. Aged 29, Wessman returned to his homeland to manage a small, near-illiquid generic drug maker called Delta. That company would one day become the multibillion-dollar pharmaceutical business Actavis. Naturally, such a major change rarely comes without risk: “I took a personally guaranteed loan for €10m ($11.8m) and grew the organisation from 90 people in 1999 to more than 11,000 people in 2007, integrating over 30 acquisitions along the way,” Wessman told World Finance. After overseeing an eight-year period of impressive growth, in which share prices rose on average 55 percent per year, Wessman left Actavis in 2008. This would later prove to be a defining moment in his career. In June 2009, Wessman – by now Chairman and CEO of Alvogen – met with investors at a restaurant in New York City, where he described his vision for a business that, he believed, would go on to become a serious player in the highly competitive pharmaceutical industry. To help visualise his thoughts, Wessman grabbed the only writing material available to him: a paper napkin. Through a series of bullet points and diagrams, Wessman illustrated the company’s unique selling points, outlining his vision for the “best-in-class business development” and the “best people, and strategically targeted portfolio”. More specifically, Wessman planned to utilise a 125-year-old manufacturing plant in New York as a platform for entry into the US market, while simultaneously expanding operations in emerging markets in the Central and Eastern European (CEE) and Asia-Pacific (APAC) regions. The odds were not in Wessman’s favour: the global economic crash had left him with an empty wallet and, by the time he left Actavis in 2008, the crisis had cost him a whopping $250m. With his prospects shrouded in uncertainty, Wessman took a big leap of faith and used the last of his savings to secure a product portfolio of generic drugs that were under development. Wessman pinned his hopes on a small-contract manufacturing platform in upstate New York called Norwich Pharmaceuticals, a company with only $37m in revenues and no profits at the time. It quickly became apparent that Norwich’s facilities would require a $50m upgrade to bring them up to scratch. With the knowledge of what he had achieved at Actavis, the company’s owners placed their faith in Wessman and agreed to inject new equity to finance the renovation. In order to secure the funds, Wessman would have to take over as executive chairman, acquire a 40 percent stake in the company and provide a new portfolio of products. But the fact Harvard Business School wrote a 16-page case study on Alvogen at all probably tells you all you need to know. When Norwich’s shareholders agreed to fund the $50m facility upgrade, they provided support for a new future; the Alvogen journey was about to start. Keeping the promise he had made to investors in the New York City restaurant, Wessman’s first move was to attract the best talent in the industry. He reached out to a number of former colleagues, who quickly got on board with the new project. The small-but-experienced team set out to make a name for Alvogen, grabbing hold of every product licence available to them. By the end of 2009, Alvogen had secured 50 new products for its portfolio. This early success prompted a recruitment drive, with Wessman and his team developing a strategy that targeted specific markets and products, those they believed would set the company apart from existing market leaders. The strategy consisted of five key elements: simultaneously entering emerging markets in CEE, APAC and the US; establishing a portfolio of high-value-added products specifically targeted at the needs of each market; developing a range of difficult-to-make drugs in house; targeting strategic value-added acquisitions; and forming a number of tactical alliances in order to have flexibility in its manufacturing and business development, while keeping costs low. Alvogen set about implementing this strategy, establishing operations in 35 countries throughout its target regions and growing each region with tactical acquisitions and quick market entry. The company grew quickly, with Wessman attributing Alvogen’s early success to its high-quality portfolio of value-added products, supplied in the most reliable timescale and quantities, and its first-class customer service. Now, eight years on, Alvogen has built a solid commercial presence in 35 countries around the world and is already well advanced in biosimilars in the CEE region through partnerships. The company’s most notable success is the production of a generic equivalent to Tamiflu which, in its first three months on the US market, delivered hundreds of millions in sales. More importantly, Alvogen estimated the drug saved US patients in excess of $500m this past flu season. Alvogen’s generic drug for Alzheimer’s, rivastigmine, has also delivered great value to patients, and supported growth in the US market. Further, since Wessman took over, Alvogen has delivered seven consecutive years of high growth and expansion and is today among the fastest growing companies in the industry. Meanwhile, its sister company, Alvotech, has seven monoclonal antibodies in its biosimilar pipeline, which are expected to be launched after 2020. In 2015, Alvogen’s upward trajectory caught the attention of a consortium of investors who, led by CVC Capital Partners and Temasek, acquired a majority stake in the company. But it has not always been smooth sailing since Wessman came on board eight years ago. Alvogen has had its share of challenges due to the demanding cash needs that accompany rapid market expansion and portfolio development. However, no success story is without its hurdles, and Alvogen has overcome much adversity to deliver a very healthy cash flow, now boasting reasonable leverage and a strong profit margin of over 30 percent. Such success led Wessman to found Alvotech in 2013, investing heavily in the development and manufacture of biosimilar monoclonal antibodies. Through a combination of apt market timing and product identification, Alvotech has quickly established itself as a key player in the biosimilar arena. From the very start, Alvogen’s objective has been straightforward: to transform into a leading global pharmaceutical player with a well-established business in generics, branded pharmaceuticals, over-the-counter products and biosimilars. Under Wessman’s leadership, the company is currently on target, boasting an annual turnover in excess of $1.1bn – a 26-fold increase in just eight years. When Robert Wessman founded Alvogen in 2009, he wanted to focus on creating difficult-to-make molecules and expand the business into emerging markets in Europe and Asia. Wessman also knew that a strong presence in biosimilars would be vital in the years to come to fuel growth when the number of generic products coming off patent would decrease. While small-molecule chemical drugs are fairly simple to produce, biosimilars rely on complex protein structures made by living cells. Today, biosimilars are used to treat autoimmune diseases, such as arthritis and inflammatory bowel disease, as well as being used to fight cancer and diabetes. Naturally, they are in high demand. Until recently, there has been no regulatory pathway in place for the approval of generic versions of biological drugs, but this is now changing and companies like Alvogen can bring biosimilars to market once the original patent has expired. With rising cost pressures in the healthcare sector, growing confidence in biosimilars and a number of prominent biological products losing their exclusivity, Wessman was convinced biosimilars would quickly begin to gain approval, and subsequently be adopted around the world. However, Wessman and his team would need to work quickly to ensure Alvotech got a footing in the market before others made their moves. A decision was made to build a state-of-the-art bio-manufacturing facility capable of developing and producing biosimilars on site. The inauguration ceremony for the 13,300sq m plant – which houses upstream and downstream manufacturing facilities, laboratories and offices – was held in June 2016, and marked a major milestone in the company’s quest to become “the best, most flexible supplier” in the biosimilars arena. Wessman believes that Alvotech’s “fast-to-market approach, backed up by experienced and determined clinical development and regulatory affairs teams” will allow it to seize the “historic” opportunity that biosimilars presents. One key pillar of Alvotech’s strategy is speed to market, which it has built into the business through integration, focus and specialisation. Alvotech has four development sites located across Europe, integrating the entire value chain necessary for the creation of a biogeneric product. The four sites are located in Jülich, Hanover, Zurich and Reykjavik. The Jülich site focuses on cell line development and process development. In Reykjavik, Alvotech has built a state-of-the-art manufacturing capacity using flexible single-use technology, while in Zurich, a brand new office has been established for its expanding regulatory, clinical development and operational teams. Finally, in Hanover, Alvotech’s recent acquisition of Glycothera has extended its capabilities in product characterisation. To date, Alvotech has invested hundreds of million of dollars – a hefty sum for an undeveloped biosimilar company. However, Wessman is convinced it will pay to make strong early moves. He predicts that many generic players will hold back on their investments in biosimilars as they struggle with their core small-molecule businesses: “For many of those companies, it will mean coming late to the game. 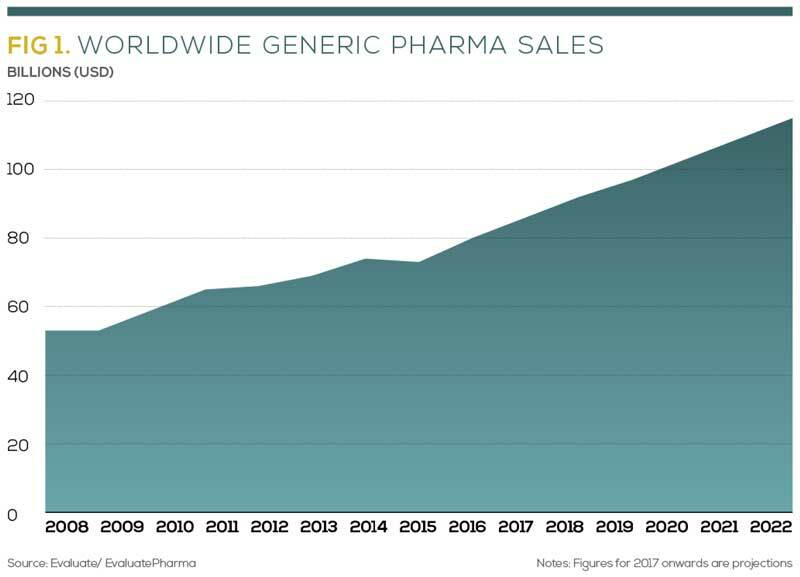 It won’t be long before the largest generic products in the world emerge from launches of biosimilars into the US market. I will even dare to say that we might see the first $1bn generic product emerging within the next five years. “One thing everyone in the generic pharmaceutical industry must realise is that the industry has changed suddenly and permanently. And while there will be a lot of turbulence going forward, there will also be opportunities. It is now up to each stakeholder to determine the best way forward for them. By the time the Alvotech plant was up and running in 2016, the global biosimilars market was estimated at a healthy, albeit relatively modest, value of $3.4bn. However, projections suggest this figure could reach $36bn by 2022. So far, Alvotech has committed more than $300m to the development of a pipeline of complex biosimilar products. This pipeline includes seven monoclonal antibodies, the first of which is expected to launch in 2020. Alvotech identifies these products based on patent expiry dates; more than $100bn-worth of biological pharmaceutical products are expected to have lost patent protection by 2021. Many of these products are among the bestselling drugs in the world today and, thanks to the unique Icelandic intellectual property environment, Alvotech can launch products anywhere in the world the moment a patent expires in any given region or country. The company has already started to sell biosimilars in CEE markets. For instance, through its partnership with Hospira (now Pfizer), Alvotech launched Inflectra in this region, representing the first biosimilar monoclonal therapy to be approved for the treatment of inflammatory conditions, including rheumatoid arthritis and psoriasis. More recently, Wessman has called for the introduction of new measures to facilitate biosimilars’ entry into the US market. Wessman wants to implement a policy of interchangeability, in which biosimilars would be able to be switched with their reference product once the patent had expired. He has also requested that biosimilars are able to launch at approval, thereby removing the reference product manufacturer’s right to an additional six months of exclusivity following the approval of a biosimilar. In addition, Wessman advocates the implementation of mechanisms that further support generic penetration and allow for free competition. The importance of Wessman’s requests were substantiated when the Pharmaceutical Care Management Association suggested that bringing biosimilars to market could help save the US approximately $100bn over the next 10 years. Since Wessman outlined his objectives, there has been significant progress in two of the three areas. In terms of interchangeability, in January 2017, the FDA issued a draft guide outlining what needed to be submitted in support of an interchangeable application. Meanwhile, in June 2017, the US Supreme Court ruled biosimilar companies would be able to essentially launch products upon approval, by allowing companies to provide notice of the drug’s launch prior to the FDA’s final sign off. With so much progress being made, there is a real sense that the time for biosimilars is coming. Wessman believes Alvotech, with the backing of sister company Alvogen, can establish itself as a market leader for years to come. Wessman believes a solid corporate culture is a crucial component of success. As such, he stresses the importance of not only selecting the most talented and hardworking individuals, but also those who place the success of the team ahead of personal achievement. Under Wessman’s leadership, Alvogen and sister company Alvotech are setting new industry standards, delivering the highest quality products and services to patients across the world. Wessman said: “Our company culture has always been ‘be the change and do it with passion and optimism’.” Indeed, as he has demonstrated time and time again, changing the game really is what Robert Wessman is all about.